A haven for sports and leisure. Washington State offers plenty of activities to keep you busy, from professional sporting events and alpine skiing to a relaxing round of golf on a PGA championship course. You’ll also find interesting festivals, quaint communities, challenging hikes and enough theater, music and art to keep your social calendar filled all year long. With 8,000 lakes, 50,000 miles of rivers and streams and 3,200 miles of shoreline, Washington is an aquatic paradise. The state has the highest per capita boat usage in the United States – roughly one boat for every five residents. In addition to powerboating and sailing, enthusiasts can water ski, windsurf, kitesurf, jet ski, paddleboard and even rent a motorized hot tub or luxurious houseboat to enjoy a day of fun in the sun. Along the Pacific Ocean, you can go surfing or enjoy a relaxing drive or stroll on the beach. The Puget Sound and the Strait of Juan de Fuca offer seasonal whale watching and fishing expeditions and most lakes and rivers are open for sports fishing. Local delicacies include geoducks (large clams), razor clams, salmon and Dungeness Crab. Thanks to the geographic diversity of the state, Washington offers plenty of activities for outdoors enthusiasts. There are hundreds of miles of trails through old growth forests that take you to spectacular waterfalls, offer glimpses of active volcanoes or open unexpectedly into meadows that are overflowing with alpine flowers. You can go scuba diving to see the largest octopi in the world, go off-roading through winding mountain roads, horseback on an endless stretch of beach or set up camp on a deserted ridge overlooking the Olympic Mountains. In winter, you can shift gears and go cross-country skiing, snowshoeing or snowmobiling in the Cascades. Major ski slopes are a short drive from most population centers, offering skiers and snowboarders plenty of powder to carve. If you enjoy sports at a slightly slower pace, there are 334 golf courses in Washington. Given the terrain, many of these courses will challenge even the most seasoned pro. Washington has three national parks, 120 state parks and numerous wilderness areas and recreation areas. Here you’ll encounter deer, bears, cougars, coyotes, elk, moose, foxes, marmots and more. The only venomous creatures are rattlesnakes in Eastern Washington, but residents who’ve lived here their entire lives will tell you they’ve never actually seen one. Washington’s unique history has provided it with a fertile landscape for creativity. Where else in the U.S. can you find a museum dedicated entirely to pop culture and the Northwest music scene or get the chance to blow a glass masterpiece like Dale Chihuly? The state has an eclectic arts scene with plenty to keep you busy, from world-class art, cultural and historical museums such as the Seattle Art Museum or Burke Museum, to symphonies, Broadway-level theater, the ballet, film and a vibrant public arts program that encompasses everything from street musicians to sculpture parks. During the summer, you can catch a concert in the park or at the zoo after hours or venture to the Gorge overlooking the Columbia River for some head banging rock ‘n’ roll. The music scene is particularly lively. Washington gave the world Jimi Hendrix, Heart, Pearl Jam, Macklemore and the entire grunge scene, not to mention Bing Crosby, Kenny G. and Kenny Loggins. Today, this focus on music lives on in local bars and clubs where area acts perfect their sound and attract sizable and loyal followings. 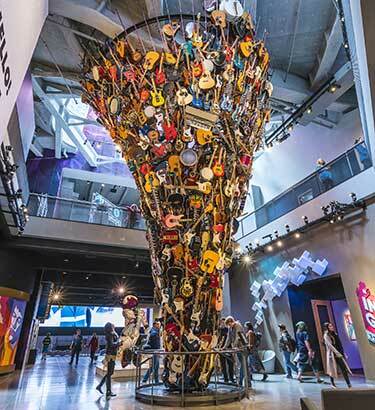 As an ode to the area’s music roots, the Museum of Pop Culture was designed to look like a smashed electric guitar from the air and has an instrument tornado (pictured). Twenty-nine different Native American tribes are part of Washington’s cultural landscape. If you want to learn more about their history, you can visit several tribal history centers, including the Yakama Nation Museum and Cultural Heritage Center and the Makah Museum. The Washington State History Museum in Tacoma traces the origins of many of these tribes and has informative interpretive displays about their first encounters with explorers and early settlers. While winter has its share of events such as the annual Christmas lighting of the Bavarian-themed town of Leavenworth, spring, summer and fall offer up one event or festival after another. The predictably good weather brings out thousands who enjoy countless community celebrations, chili and chowder cook-offs, wine tastings, arts and music festivals, boat races and cultural events. You can even experience a bit of Washington’s pioneer history with a visit to local rodeos, such as the Omak Stampede, or spend a weekend at a county fair enjoying delicious scones, onion burgers, concerts, pig and car races and carnival rides. Many communities host annual food celebrations, with local restaurants, bakers, brewers and winemakers sharing their love of food. The state’s rich maritime history is celebrated in many communities. Enjoy a day in Port Townsend at their annual wooden boat festival, take a sail on a replica of Captain Vancouver’s sailing vessel or experience the thrill of unlimited hydroplanes flying deck-to-deck at 200+ miles per hour in the Columbia River. Learn more about Washington’s arts, culture and heritage scene. Some 300 crops grow in Washington, so it’s only natural that food and drink are an important part of the state’s culture. If you love seafood, you’re in the right place. Residents ask for their oysters and mussels by the name of the bay they came from and can tell the difference between Sockeye and King salmon by the color of the flesh. Locally sourced produce, meats and cheeses are part of the foodie culture and it’s easy to find locally grown and produced goods at neighborhood farmer’s markets. Eastern Washington is a prime growing region for grapes. Its 13 designated growing regions create ideal microclimates for more than 900 wineries. Locally crafted beers and spirits are also a major part of the dining scene. The state boasts about 350 breweries and brewpubs and 120 distilleries, many crafting products from locally grown and sourced ingredients, giving their products a unique Northwest flavor. Of course, Washington is also the birthplace of Starbucks and coffee lovers will find a coffee shop on nearly every block in major population centers and even some smaller communities. Everyone has their favorite coffee, roast and barista and will gladly let you know where you should go for a hot cup of premium joe.